Is Pool Chlorine the Same as Household Bleach? The liquid chlorine used by the pool service industry is twice as strong as the bleach you use for cleaning and laundry. Pool chlorine has the additional property of strong anti-microbial activity so it can kill germs. 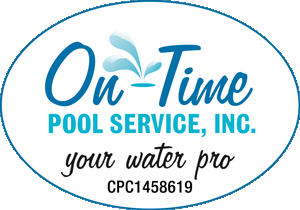 Two forms of chlorine are commonly used in pool service. 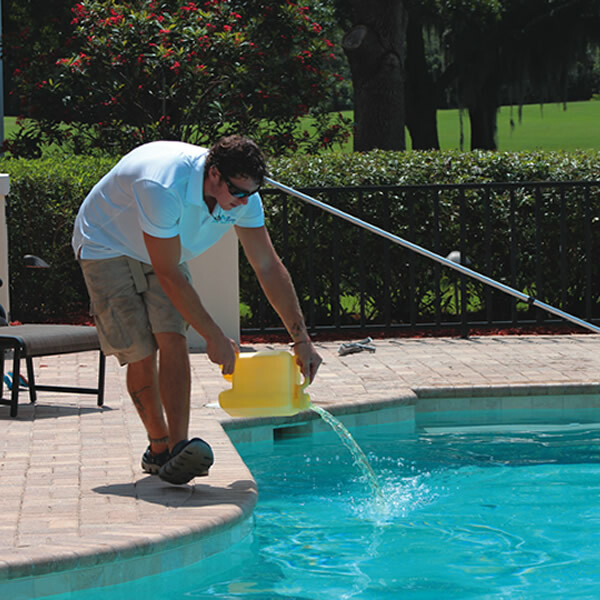 Liquid chlorine, stored in the yellow jugs, is primarily used in the cooler months when pool use and chlorine demand is low. During the hot summertime, when more chlorine is needed, solid chlorine tablets are generally used. These dissolve slowly, releasing chlorine throughout the week. The enemy of pool service providers is algae. There are three common types: yellow, green and black algae. Each one requires a different method to effectively kill the algae and remove it from your pool. A “salt water” pool uses a very low level of salt to produce its own chlorine and maintain it at a low level. The amount of salt is only about that of your tears so you really can’t even taste it. Besides automatic chlorine production, one of the other advantages of a salt water pool is the added salt softens the water and makes it much gentler to your skin. 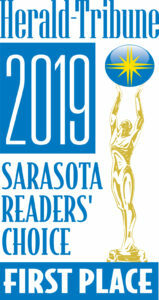 If you use your pool a good deal, a salt water system is an excellent option to consider. SOLAR – doesn’t cost anything to operate but will add only about 10 degrees to the water’s temperature. ELECTRIC – an electric heat pump is most common option for most pools. Their operational cost is relatively low because their heat source is the surrounding air. Heat pumps can take a day or two to warm up a pool though. When it is very cold outside, they are less efficient. GAS – will heat up water very quickly but carries a higher operating cost. They are most commonly used in heating spas. How Long Should You Run Your Pool Pump? A swimming pool’s pump needs to run longer in the summer than the winter. Generally, eight hours is required during warmer months and about six hours during the cold season. Who Can Be a Pool Cleaner? Anyone can start a pool business. No special certification, licensing or official training is required by the State or County to take care of residential swimming pools. For this reason, it is very important to make sure your pool service provider is technically skilled as well as fully insured (liability and Workers’ Compensation Insurance). A pool can normally lose 1/4 – 1/2 inch of water a day but if you suspect a leak, a simple Bucket Test will give you the answer. Put water in a bucket and mark the water level. Place the bucket on the top stair of your pool and mark the water level outside the bucket. Wait 3-4 days and see if the water level outside the bucket has dropped more than the water level inside the bucket. If you conclude your pool is leaking, call us and we’ll provide you further direction for detection of the source and its repair. When Do I Need to Resurface My Pool? 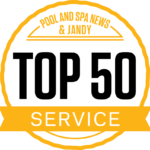 Generally, a pool’s surface will last 10-15 years before it needs resurfacing. But the exact time is best determined by your eyes – when it looks too unsightly to you, it may be time for a new surface. Contact us for a consult and will provide some quality referrals.